SOLD JUST 5 DAYS FOR 99.7% of LIST PRICE & IN COMPETING OFFERS!! Just in time for Fall Semester! 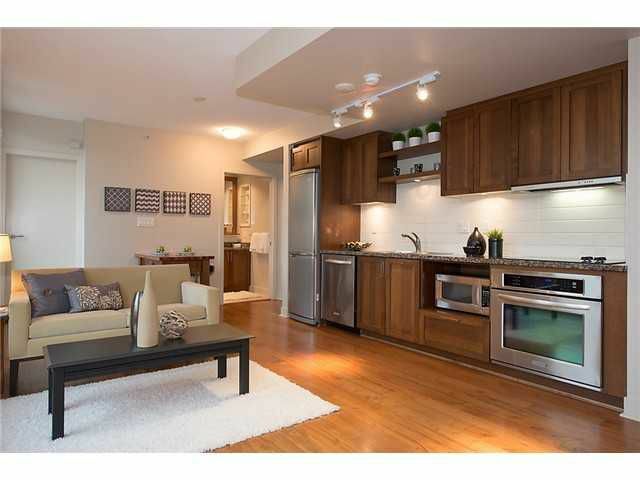 SLEEK MODERN 6-yr-old CONCRETE STUDIO w/PARKING in the heart of KITS. Open concept w/zero wasted space allows free flow between living areas & a bright wall of windows. Hrdwd flrs & roll blinds, rich dark-stained kitch cabinets w/under-cab lighting, granite counters, stainless appl's & mobile island...ideal for dining and/or extra prep space. Built-in murphy bed (easily upgraded to double/queen), juliette balc & direct access to common roof garden, meeting rm & GYM. Great storage incl. huge walk-in closet/den. In-suite laundry, alarm, SECURE PARKING Included & RENTAL STORAGE($25/mo) possible. RENTALS & PETS OK. Solid concrete bldg, amazing location right on B-LINE to UBC! OPEN SUN JULY 6th, 2-4pm.